It can save money in the long run! Choosing the best baby activity center can seem daunting. As a parent, I want nothing more than to give my children everything that can bring them happiness — even if that means my once-minimalist house is filled with rainbow-colored toys. But, if you lack storage, the number of items that babies require can become overwhelming. So, when any company claims a product can grow with a baby into toddlerhood, it catches my eye. That's why I bought Skip Hop's baby activity center on Amazon about a month ago. Now, I’m shouting about it from the rooftops. My baby just turned 4 months old. His toys are multiplying and getting bigger. I always knew I wanted to get him an activity center in order to give him more time in an upright position and expose him to more developmental activities. But, these things take up a lot of space, often look ugly and can cost a good chunk of change. The sleek design and pops of color drew me to the Skip Hop Explore and More Baby's View 3-Stage Activity Center. But what really sold me was that it can convert into a play table once my baby outgrows the toys. That was reason enough to add it to my cart. Now, I play with my baby in the activity center once or twice a day. The white table features a comfy gray and white seat that lets him rotate 360 degrees. Four toys securely attach to the table with a clip system. You can rearrange them as you wish. I, personally, love playing with the peek-a-boo owl that pops out and hoots (parents can have fun too, right? ), but my baby is especially drawn to the hedgehog. It also comes with a spring cloud with colorful beads, a set of plastic trees that move back and forth and a dishwasher-safe suction snack bowl. If you need to store the table, you can take the legs off so it'll fit in a closet or under the bed more easily. But, the idea is that you won’t have to store this thing when your baby gets older, because it converts into a table he or she can sit at to color or play. You can even buy specific Skip Hop chairs for when your baby can finally walk. This activity center might seem like it's on the pricier side, but I've found that it's worth it. My baby loves it, it looks sleek and, thanks to the conversion feature, we’re going to use it until he's a few years old! This one costs a little bit less than the Skip Hop, but it’s a jumper rather than a table. It’s also got more than 6,000 reviews on Amazon and a five-star rating. This comfy chair includes a toy bar that babies can interact with. Plus, there’s a soothing vibration feature. 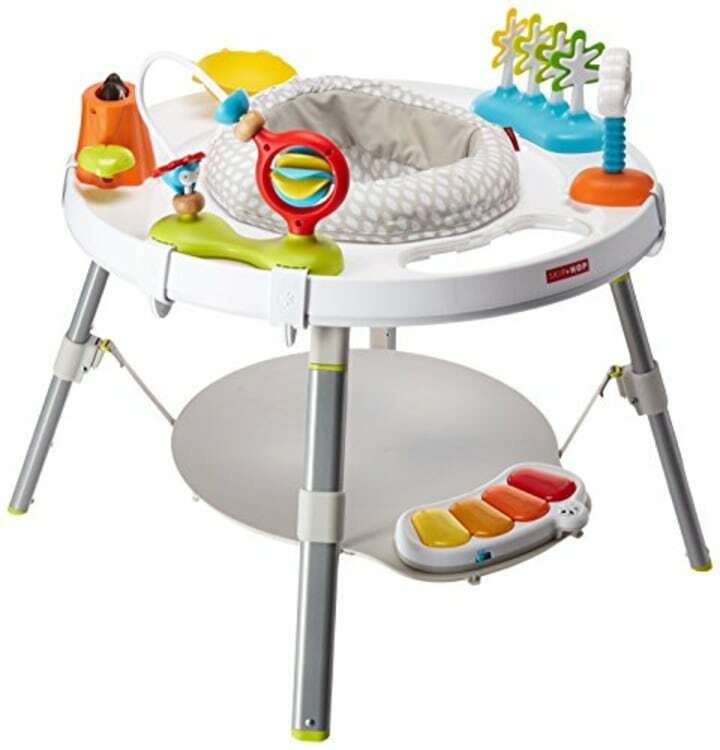 If your baby is too young for an upright activity center, this gym is a great way to keep babies entertained on their backs or during tummy time.